The T-33 is a two seat military jet aircraft developed by Lockheed Corporation in the USA that was introduced during 1948. Originally designated the TF-80C, the T-33 made its first flight on March 22, 1948. Production continued until 1959 with 5,691 T-33s built. 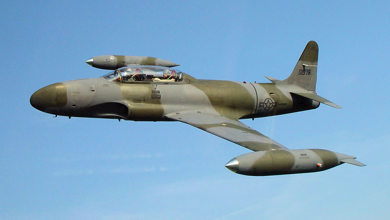 In addition to its use as a trainer, the T-33 has been used for such tasks as drone director and target towing, and in some countries even as a combat aircraft. A reconnaissance version ( RT-33A ) made primarily for use by foreign countries, had a camera installed in the nose and additional equipment in the rear cockpit. Having served with the air forces of more than 20 different nations over several decades, The T-33 is one of the world's best known aircraft, outlasting even its successor the F-94 Starfire. During the summer of 1952 a USAF F-86 interceptor out of the 34th Air Defense Division in Albuquerque USA fired at a flying saucer. The incident was considered so confidential that the Division Commander, Colonel Methany ordered all written copies of the incident to be destroyed. However Lieutennant Glen Parrish, the intelligence officer handling the case preserved one copy in a locked safe and called Edward J. Ruppelt to arrange a face-to-face meeting. Coincidentally, on his way to the meeting, Ruppelt's airline reservations got fouled up. Rather than face a delay of several hours, Parrish volunteered to pick Ruppelt up at the airport in a T-33 and fly him back to the base. When they arrived at the base, the intelligence officer told Ruppelt about the incident and showed him the report, the details of which are outlined in the opening chapter of Ruppelt's classic exposé, The Report On Unidentified Flying Objects.